doiMoi is hot new addition to Logan Circle and I was excited to check it out for the first time despite a website that doesn't tell you anything about the restaurant and displays an outdated menu. 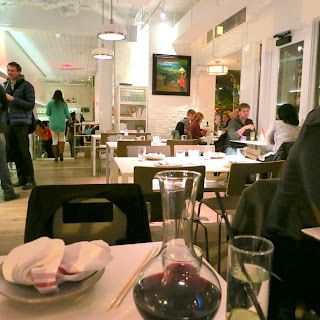 I've actually avoided this restaurant for the past few months for two reasons: (1) they don't take reservations after 6 p.m. for small parties, and (2) related to that, there is usually a long wait to get in. So better to go on a holiday weekend? I think so! 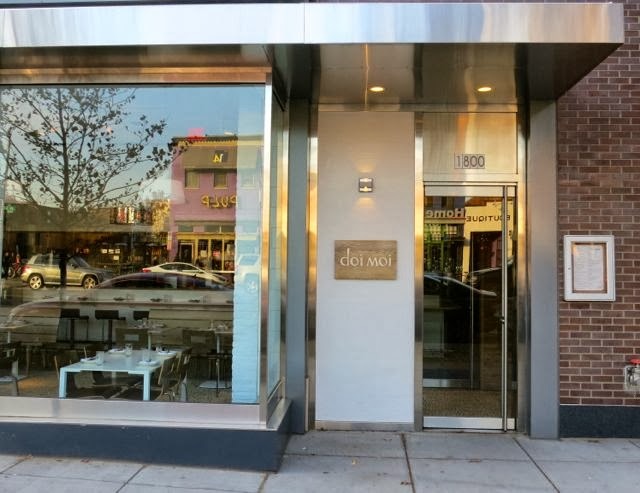 doiMoi's menu consists of Thai and Vietnamese dishes with a small plate concept, which is the growing trend in Logan Circle nowadays. With hardwood floors and sleek white furniture coupled with white light fixtures, the look is trendy yet clean. We went over to the bar, but then quickly realized that there was actually seating available because it was a holiday weekend and we were seated immediately. We perused the wine list and found some interesting wines including wines from Greece and Lebanon as well as a Carignan mix. Despite that, we went with a Nebbiolo from Langhe, Italy. This big, bold wine really needed to breathe so we had them decant it, but it still didn't really open up until we were almost finished. I glanced at the menu and noticed the vegan items weren't listed so I requested the vegan menu. Online, they have a link for the "vegan" menu, but it is actually a dietary preferences menu that includes vegetarian, gluten-free, and vegan sections so it is a bit confusing. Once we figured out where the right section was though, we were pleased to see so many vegan options -- nine to be exact. So we decided to order four small plates. The first one to come out was the Kanom Pak Gadd or Crispy Radish Cakes($8). 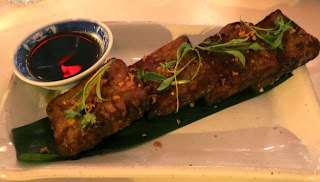 I don't know how they made these, but they came out as crispy deep-fried rectangular cakes. I dipped mine in the mushroom soy dipping sauce and gave it a try only to find that it was much better than it looked. In fact, it was delicious though a bit too over-fried. Made with radishes and wild mushrooms, this first dish got me pretty excited about what was to come. 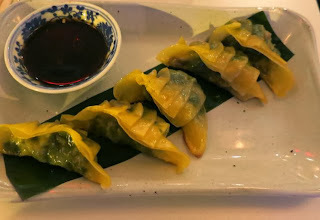 Next up was the Gui Chai, Pan Fried Garlic Chive & Mushroom Dumplings ($8). We found the dumpling wrappers to be a bit sticky, but the mix of mushrooms and garlic inside the dumplings was delish. They paired well with the sweet soy black vinegar dipping sauce. 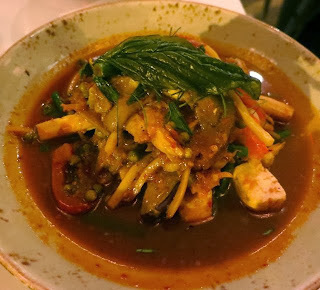 Next up were the Phet Mak or really spicy dishes -- always my favorite. I often don't trust that curries are vegan so I was happy to see one on the menu and had to try it! I'm so glad that I did. The Gaeng Par Hed ($13) was a red curry made with red peppers, wild mushrooms, bamboo shoots, snake beans, greens, housemade tofu, and lime leaf. The vegetables were cooked to a perfect tenderness and the curry was amazing. Lastly was one of our favorites -- the Het Paa Naam Tok or Isaan Style Wild Mushroom Salad ($11). I don't usually get that excited about salads, but this one was unique. 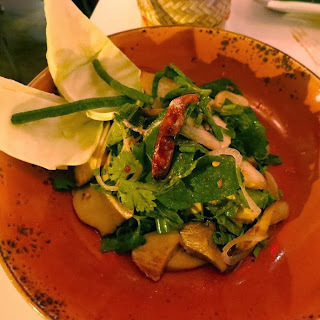 They sliced the wild mushrooms thinly, but not too thinly probably using a mandoline and served them with shallots, saw leaf herb, dried chilies, toasted rice powder and lots of fresh herbs. It was really the dressing, the tender somewhat marinated wild mushrooms and the fresh mint, cilantro, and basil that made this salad simple, elegant, and delectable. I guess for a restaurant headed up by Executive Chef Haidar Karoum of Proof and Estadio, one could only expect the best. The name "Doi Moi" refers both to Vietnam's economic reforms in the 1980s and 14th Street's present-day surge of energy. I think they hit that right on point. The service was great, wine list fantastic, and food divine. I can't wait to come back to try the rest of the vegan menu. And with a seasonal, always changing menu, it sounds like there will always be new options. Highly recommended.